It’s finally here! The Stanley Cup Final is upon us. From the Western Conference, the Los Angeles Kings have battled through the defending Cup champions and look for their second championship in three years. From the Eastern conference, the New York Rangers have been the perennial underdogs who find themselves in the Stanley Cup Final for the first time in twenty years. With talented rosters and very different roads to reach the Cup Finals, the question is who has the edge? Both teams have been up and down this postseason and have been on the brink of elimination. 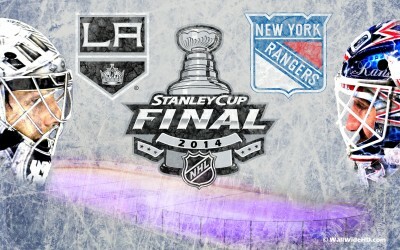 Now we have the battle between Los Angeles and New York City to see who will be the Cup City. Let’s see how these two teams matchup. This will be a close series. One lucky bounce or bad penalty could decide the who will be champ. The Kings do have home ice advantage, but the Rangers have played well on the road with a 6-4 away record. This will be a great series that will go at least six or seven games. While I won’t be surprised if the Kings win, especially with their experience and if Quick is on, the Rangers are my pick. With their clutch scoring, defense, and Lundqvist in the net I believe the Rangers have the slightest edge and will bring back the cup to New York for the first time in twenty years. Previous Mets break record! Most cheesesteaks eaten!